Map of northern Mason Valley, NV showing irrigated fields (polygons). Colors represent amounts of seasonal evapotranspiration derived from Landsat satellite thermal imagery (blue is high water use, and red is low water use). Apr 10, 2012 • Speaking at an important state-wide water summit in March, Nevada Governor Brian Sandoval lauded DRI’s METRIC program calling its Landsat satellite technology an important tool in monitoring water usage. In his keynote address at the Nevada Water Resource Association (NWRA) annual conference in Las Vegas , Sandoval said the Desert Research Institute is solving critical water issues through ground-breaking research, such as mapping agricultural consumptive water use from space using Landsat satellite thermal imagery. This project was initiated by DRI research professor James Thomas, Ph.D., and led by DRI assistant research professor Justin Huntington, Ph.D., with collaboration from University of Idaho research professor, Richard Allen, Ph.D. and hydrologist Adam Sullivan, P.E. from the Nevada Division of Water Resources. 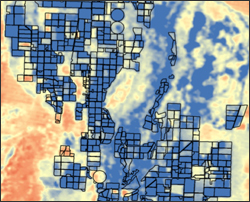 Huntington and his colleagues at DRI create evapotranspiration maps using a program called METRIC, which stands for Mapping Evapotranspiration at high Resolution using Internalized Calibration. METRIC was developed by Allen at the University of Idaho, and first implemented for water right management by the Idaho Department of Water Resources. Huntington and his colleagues have enhanced METRIC so that the Nevada Division of Water Resources can use the program for day to day operations and monitoring of water use and special projects. The program relies on Landsat satellites which take high resolution digital pictures of earth in the visible and invisible spectrums, with primary reliance on Landsat’s thermal infrared imager. This imager captures digital pictures of land surface temperature. Each ‘pixel’ of a Landsat image represents a 30 meter by 30 meter area so the researchers can see at scales fine enough to record when farmers irrigate fields, or natural land surfaces become wet, and water evaporates from soil surfaces and transpires through plant leaves. These processes combined are termed evapotranspiration (ET). ET consumes energy, making the surface cool. This cooling is easily detected using Landsat’s thermal imager. “After all, it is at the field scale that water rights are managed in the west,” Huntington said. Landsat satellite imagery required to make METRIC ET maps is currently free of charge and publicly available through the U.S. Geological Survey’s Earth Resources Observation and Science Center. According to Tony Willardson, Executive Director of the Western States Water Council, agreement on the data and the models that use those data go a long way in resolving water conflict issues, as the level of detail needed to resolve issues is on a field by field basis. “The biggest challenge faced by the water management communities right now is to keep the Landsat program and future satellites funded and on schedule,” Allen said, who is also a member of the national Landsat Science Team. Currently only one Landsat is functional and it is not able to collect complete images, according to Allen. The next Landsat, Landsat 8, will be launched next January.